Inform you colleagues immediately about your business or personal achievements. The Message board module displays important news from your colleagues, directly on your dashboard. Anyone from the company may comment on them or “Like” them. What is the use of the Message board? The Message board will be mostly used to share informal messages between employees. The module is a perfect addition to the Corporate social network, and works as a tool to share news with the whole company. Colleagues can share various news, from a successful business to a birth of a baby. The Message board widget on the dashboard offers an ability to instantly comment and “like” any article. The corporate Message board can be used by all employees, for it is not limited by any rights. Interchange mass mailing system with quick announcement, through which you can share personal (marriage, newborn baby) as well as work-related (new employee, new coffee maker) news. The Message board could be also used to organise a corporate party. The posts on the message board will not be missed, because the message board can be pinned to the dashboard. Additionally, a system notification can be set to notify about new posts. 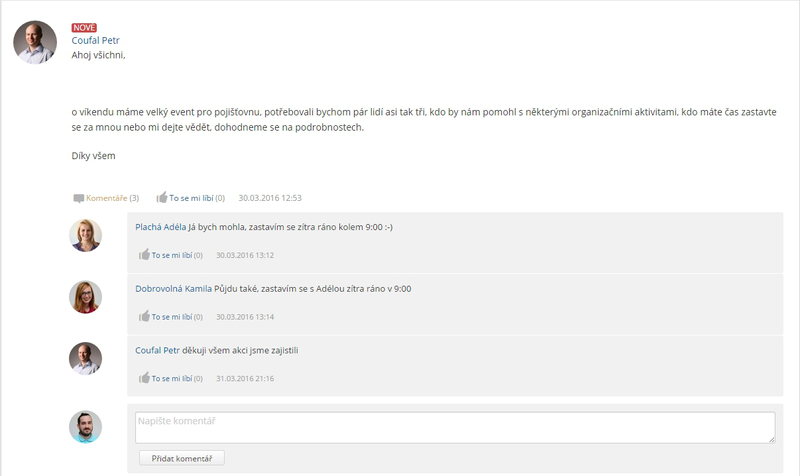 Posts on the message board can be commented and “liked”. The comments, through which your employees express their opinion are displayed in chronological order under the post. The comments carry an incredible option to discuss and gather new ways to solve a problem or learn new know-how. Have you missed an article that was interesting? All you have to do is to fill in the author of the post, a part of the text or date the post was published. Write an article about your experience from a conference, inform about successes of your department or share your own know how. Develop firm and healthy relationships between your employees. Celebrate their birthdays, have an overview of boarding dates, all thanks to the Important Events module. The module works with dates of birth and boarding dates. You will never forget to congratulate your colleague. Chceck price list for the price of the Message board module.